Having heard a mention of this book on NPR, I happened to come across it in the New Books section at the library, and immediately picked it up to check out and read. It was close to perfect for me and reminded me of just sitting down to a cup of tea with this charming author. Being a ravenmaster (or person in charge of the ravens at the Tower) is quite a new job title, despite the long history of the location. People have only been given the title since the late 1960’s – before that, staff (i.e. the Beefeaters*) would look after the ravens, but it was put under the responsibilities of the quartermaster (or similar). And it’s the little (and surprising) tidbits that really drew me into this read. Skaife is the perfect guide to this small but prestigious world of people who live within the grounds of the Tower of London. (And the Beefeaters and their families really do live inside the castle. The drawbridge is pulled up every evening around 11 or so, and then the inhabitants are cut off from the rest of central London for the night.) The Tower is still an official royal palace and yet, despite having lived inside its confines for more than a decade, Skaife still retains his wonder and curiosity which is communicated to the reader throughout the pages. Despite the cachet of being a Beefeater (also called the Yeoman Warder), each person who holds this position has at least 24 years of unblemished service with the British military, and then once in this position, warders usually stay there for the rest of their lives until they retire. 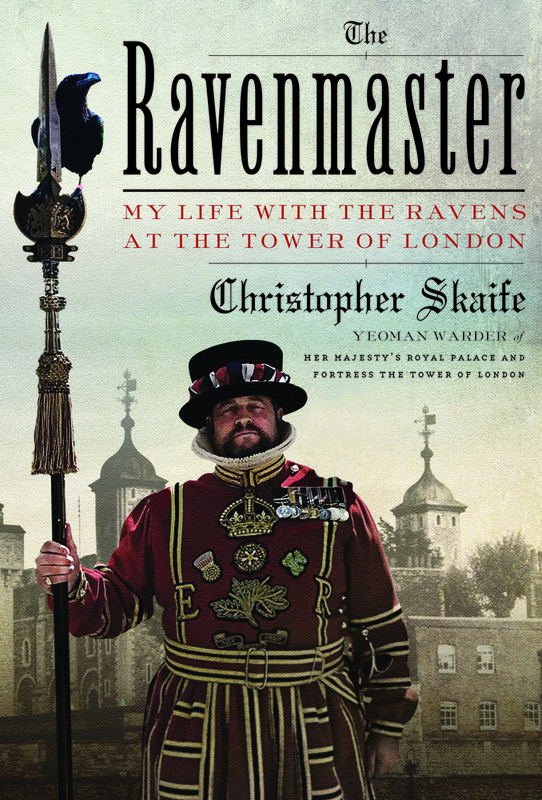 Skaife has been doing the Beefeater-ing for the past 15 years or so, and the Ravenmaster-ing for the past eight (or more?) years after completing 24 years as an infantryman (and drum major) in the British Army. He knows his stuff and reports that most of his deployment time as an active soldier was in Northern Ireland at the height of the Troubles (1970s/1980s), which means that he was frequently at risk from the IRA. So Skaife came to this position legitimately and having paid his dues. Despite being an infantryman and despite having a patchy formalized education, he succeeded when he joined the army at the (young!) age of 16 and a half. (Good for him, I say.) He’d been veering down the path of trouble in his early years, and his parents were happy to see Skaife doing some honest labor under army discipline. His time as a full-time professional soldier was spent immersed in military life, but he’d maintained a lifelong interest in history despite his early attitude to formal education. When coming to the end of his army career, there was an opening to be a Yeoman Warder at the Tower of London, and he applied and was selected. The day-to-day routine provides a general structure for the narrative, but interspersed is related information to do with the history of the Tower, its ravens and his own life. It’s a fascinating mix, mainly because Skaife seems to be one of the most charming raconteurs in addition to being a self-taught raven expert. He’s self-deprecating, funny, and modest, all of which combine to make the book read experience come across as though you’re having a cuppa tea with one of your friends. Skaife honestly seems to be one of the most genial people that I’ve ever read – he’s both convivial and authentic, and so both the reader and the ravens are in good hands with him. Plus – he has an Instagram account as well (ravenmaster1) if you’re interested. Plus my computer has a mind of its own on occasion and I’ve lost a handful of files which meant I had to recreate them. Grr. In the meantime, I’m getting the new routine sorted out and organizing the work load more efficiently, so all signs point to more blog posts in the future weeks. And so, what have I been reading? Well…. I happened to find a brand-new copy of the old kids’ book called “The Phantom Tollbooth” by Norton Juster (1961) which was quite a clever read. The title doesn’t make my Top Ten reads or anything, but it was a fun non-demanding read and just right for the overload at the beginning of the semester. 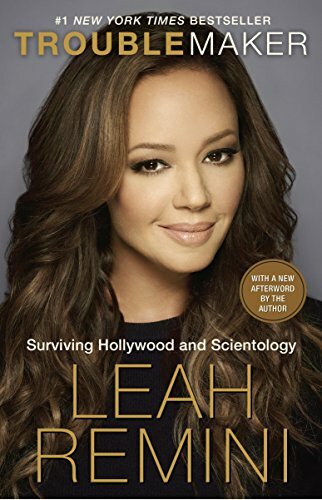 Then, I moved on to something very different: “Troublemaker”, the autobiography by Leah Remini of her years spent in Scientology. Wow. It’s a very strange way of life and costs thousands of dollars to stay in it, but its attraction, I think, is that it provides a home and a direction for those folks who are feeling a little lost in their own lives. It promises so much – eternity, happiness, riches, saving the world – but the personal cost to each individual is immense. Remini was in the religion due to her mother being a Scientologist, but when Remini was older, she saw the cult for what it really was, and tried to get out. However, if you’ve grown up in the religion, most of your friends and support system are also Scientologists, and the rule is that a Scientologist who leaves the group must be “disconnected” by their friends and family (i.e., they never speak again), so leaving is a big decision for some people. They lose their family, their friends, their entire support system… What a scary risk. So, this was a fascinating read for me, and in the end, I feel badly for the folks who get sucked into this group. Most are not very wealthy and the religion forces such spending on people that they end up declaring bankruptcy on many occasions. However, I try not to judge anyone as they’re just trying to improve their lives (and others) in many cases, but it actually does the complete opposite of that. For another perspective on Scientology, I would suggest “Inside Scientology: The Story of America’s Most Secretive Religion” by Janet Reitman (2011). I picked this book up as part of my ongoing effort to read more diverse books and combining that with the evergreen goal of reading from my TBR. Plus – it also fit in a missing year on my Century of Books project as well. Check, check, and check. On the surface, it’s a well-written autobiography of Hong Kingston, and there are strong overlaps between what Western historians would call “personal history” and the culture of being a Chinese person in America. However, this fairly straightforward personal history is filtered through a large lens of Chinese culture, myth, and folklore, and when I was done with the read, I was a bit dizzy with the whole ride. It was good, but it was a bit of a wild journey. The narrative structure is divided into five pieces. (I’d say “chapters” but I think that these separations are more meaningful than the typical chapter in traditionally structured fiction pieces.) Throughout the reading, Hong Kingston smoothly blends the facts of her childhood, myths and talk-story of old China, and then combines the result with the Chinese diaspora experience in the US. It’s very dreamy and surreal in many ways, and so the passage of time is flexible which means that you’re just not sure what is true and what is not. Be prepared to go with the flow as it’s not a linear A-B-C narrative arc. Be prepared for some magical realism type of writing. Be prepared to enjoy a mélange of Chinese myth and family dynamics of a family who are fairly recent immigrants. Familiarize yourself a bit with the Chinese Revolution history as it plays a major role in the background. Be prepared for a litany of character names: Brave Orchid, No Name Woman, Fa Mu Lan, Sitting Ghost, and loads of others. Finally, I would recommend that you read this novel in big chunks of time instead of a pick-up put-down manner. So a pretty good read, but not as awesome as I thought it was going to be. (This may have been my fault as opposed to the book’s fault though.) Plus – it’s a title off the TBR pile. Hooray for that. So, as tends to happen on the weekend, I visited the library and ended up leaving with quite the stack. I’m not sure if I will actually get to all of these, but it’s fun to have the choices.. I was interested to see that the U.S. title for the kidlit book, Bedknob and Broomstick was singular. In my mind and growing up in England, I had always heard it as plural (i.e. Bedknobs and Broomsticks), but that could easily have been a faulty memory on my part. I’m going to read this as part of my ongoing Century of Books project – it fills out 1947 rather nicely.